There are many phylogenetic similarities between humans and baboons. So much so that in 1984, a baby born with a rare congenital defect survived for a time with a transplanted baboon heart. But it was probably a monkey brain that was responsible for the silly Shakma, an alternately violent and moronic nature-run-amok movie with a premise stupider than even some of the less evolved members of the genre. Med students are prepping for an elaborate off-hours role playing game in a university research hospital, a healthcare colossus apparently stripped of telephones and lacking in basic security. The game is some kind of knighthood/damsel-in-distress test of wits, employing costumes and walkie-talkies, and most peculiarly, overseen by the school’s dean! The participants even bet on the outcome, because as we all know, medical students are known for having endless downtime and loads of disposable income. 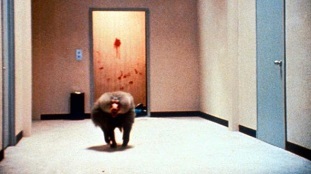 One lab animal, from which the film’s title is derived, is the subject of a corticotropic study, the peptide involved in stress responses. And boy, is this baboon stressed. Left for dead after a trial gone awry, the Old World Monkey twitches back to life and begins to hunt down the eggheads who wronged him. What follows is occasionally engrossing, frequently dull, and at times ludicrous. A metaphor for life perhaps? Roddy McDowall, sans reference to Planet of the Apes, is the dean Dr. Sorenson, in a thankless role sitting in an office blathering into a walkie-talkie. Christopher Atkins (the love interest of Brooke Shields in The Blue Lagoon) is Sam, our apparent hero. Ari Meyers (Kate & Allie) is pining after him despite looking like jail-bait. She’s dressed like Desdemona by way of a flamenco-restaurant. There’s a black guy who, after the chatting up of his girl is interrupted, returns to court her with the “now…where was I?” cliche. He also does a truly terrible Scotty impression from Star Trek. There’s a few other victims as well, none of whom is consequential or interesting. Soon, the angry grey beast is hurling itself at the med students and prof, all of whom are reduced to barricading themselves in labs, cabinets, closets, and stairwells. Hiding from one animal in a 10-storey building is a feat apparently beyond the capabilities of these future men and women of science. 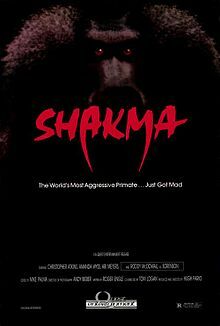 Not as violent as it could’ve been, Shakma is extremely bleak and often lackadaisically paced. Shakma is also known as Panic in the Tower, which makes it seem like some 70s inferno disaster movie. It’s certainly a disaster, but not in that sense. This entry was posted in Horror and tagged 90s movies, college movies, horror podcast, natural horror by Really Awful Movies. Bookmark the permalink. I love Shakma (the baboon, not the film) but my favourite movie killer monkey will always be Link, who is a murderous cigar smoking monkey butler that spies on Elizabeth Shue in the shower.